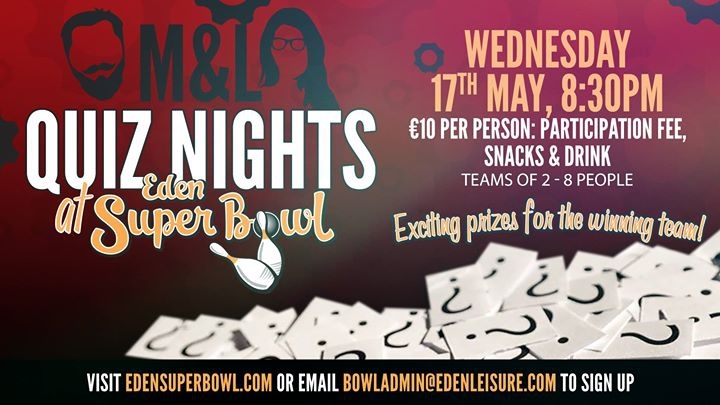 For all those trivia buffs hungry for quizzes, the Eden SuperBowl is inviting you to test your general knowledge and have a laugh at their next Quiz Night, hosted by the seasoned Quiz Masters, M&L. On Wednesday 17th May at 8.30pm, put your facts to the test in the perfect setting for a fun and relaxed night with your friends or family. Teams for M&L’s Quiz Night can be made up from a minimum of 2 people to a maximum of 8 of any age between 2 months old and 102 years young. We’ve also put together an incredible package for the evening of €10 per person. This includes participation in the quiz, food and drink. The winners are in store for some thrilling prizes to enjoy with their team!